Over the past decade there has been an explosion in the number of publications on cell culturing on the surface of nanoporous Anodic Aluminum Oxide (AAO). Neuronal cells ‘sense’ nanotopography and respond with improved neurite growth; pore diameter and period influence both the growth rate and the overall length. Neurites grow faster and longer on AAO compared to glass slides [2, 3]. AAO pore size significantly affects the extent of cellular responses of adherent neutrophils . Cells’ adhere better to AAO than they do on conventional glass slides, cell and protein adhesion is dependent on pore size [5, 6, 7] and zeta-potential . Cell proliferation increases on AAO, in many cases significantly, when compared to other substrates . Filopodia attach well to AAO by protruding into AAO pore structure, especially for certain pore diameters . Cells exhibit increased extra cellular matrix production on AAO . AAO pore depth influences cell adhesion and proliferation, but only in certain ranges. Small differences of short pores (<300nm length) appear to have little impact . Cell functionality (as measured by albumin secretion from HepG2 cells into cell medium) is impacted by pore diameter, with smaller pore leading to greater secretions . Cell migration is influenced by AAO pore diameter . Cells have been shown to communicate via diffusion through AAO nanopores, with the pore diameter used to control the diffusion . AAO pore sizes has been shown to influence whole blood cells, with smaller pores increasing procoagulant activity, but larger pores increasing platelet microparticle generation and adhesion . For an excellent recent review, see D.Bruggemann, Nanoporous Aluminum Oxide Membranes as Cell Interfaces, Journal of Nanomaterials, 2013. InRedox offers high quality AAO substrates for cell culturing and bioimaging. 50nm diameter ATO was shown to enhance osteoblast cell attachment and spreading compared to planar substrate. In particular, a better organized actin cytoskeleton was observed for cells on ATO substrate, and higher nuclear level measured by GSH distribution was observed. ATO nanotube diameter was shown to strongly influence binding affinity of plasma derived proteins, with 100nm ATO nanotubes displaying stronger binding compared to 50nm, 15nm, or plain Ti foil for the proteins studied. Bacterial biofilm growth of oneidensis MR-1 cells was shown to depend on ATO nanotube diameter, with smaller 20nm diameter substrates leading to better adhesion and growth compared to larger 140nm diameter nanotubes, and a clear trend across the 4 diameters studied. Antibacterial performance of ATO nanotube substrate can be manipulated by both nanotube geometry and photocatalytic properties. A ‘sweet spot’ of 60nm diameter nanotubes was observed for antibacterial properties when gingivalis was cultured, with smaller or larger diameters showing increased bacterial survival. Part of the antibacterial behavior is attributed to initial sterilization by UV irradiation, where the TiO2 absorbs the energy and radicals are created, leading to potential damage to the bacteria cell membranes. 80nm diameter ATO nanotubes were demonstrated to exhibit increased macrophage adhesion and proliferation compared to 30nm ATO and planar Ti. Importantly, the macrophage cells on 80nm diameter ATO showed decreased protein secretion and mRNA expression of the pro-inflamatory cytokines and chemokines. 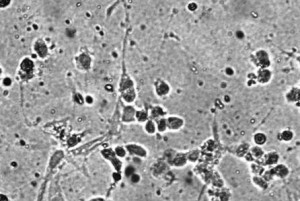 On both 30nm and 80nm diameter ATO, macrophage cells were observed to have numerous cytoplasmic protrusions and lamellipodia attaching to the nanotopography. ATO nanotubes that were initially heat treated at 500°C prior to use for in vitro cell culturing of hPDC (human periosteum-derived cells) showed improved cell proliferation as measured by metabolic activity and DNA content compared to non-heat treated ATO nanotubes. Heat treated substrates also exhibited stronger cell attachment to the nanotubes, and upregulated expression of osteogenic markers. 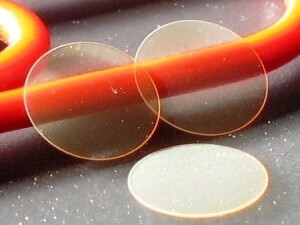 When ATO nanotube films were grown on commercially pure Ti (tube diameter ~120nm, length 700nm) and used for in vitro cell culturing of peripheral blood mononuclear leukocytes, the ATO substrates resulted in a much lower inflammatory response compared to the plain Ti (as measured by production of inflammatogenic cytokines). ATO nanotubes were compared in vitro to plain Ti to better understand primary human nasal epithelial cells (HNEpC) response to these substrates, as a model system for Ti nasal implants. ATO films of 200-300nm thickness and tube diameters from 70-90nm exhibited dramatic increase in hydrophilicity compared to plain Ti (as measured by PBS contact angle <5° vs. 59° for plain Ti substrate). HNEpC cells showed significantly enhanced protein adsorption, cell spreading, cell adhesion, cytoskeletal arrangement, and proliferation on the ATO substrates vs. plain Ti, with 90nm ATO nanotubes yielding better results than 70nm. ATO nanotubes with diameters of 40nm and 150nm were compared to plain Ti foil as a substrate for mouse preosteoblast cells. ATO substrates led to increased proliferation vs. plain Ti foil, with larger tube diameter having a more pronounced effect. The investigators also noted that FAK (Focal Adhesion Kinase) was down regulated significantly in the ATO substrates, and the increased RhoA-FAK ratio in the cells appears to play a crucial role in initial cell proliferation during the first 24 hours. Bone growth was studied using human adipose-derived stem cells (hASCs) on ATO nanotube substrates with different tube diameter (50nm, 70nm, 100nm) in both in vitro and in vivo studies (ATO substrates were implanted into mice). 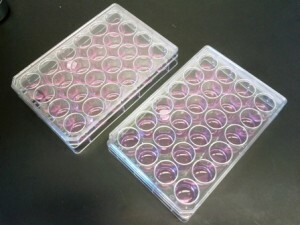 The 70nm ATO substrates were found to promote optimal bone growth both in vitro and in vivo compared to other surfaces. All ATO diameters were found to be superior to plain Ti for osteoinducing ability. The investigators find that the nanoscale geometry regulates hASC osteogenic differentiation via an epigenetic mechanism. In a study with application for neural prosthesis, ATO nanotubes were grown in both aqueous and non-aqueous electrolyte, and used as substrates for in vitro cell culture of neural stem cells. ATO grown in non-aqueous electrolyte led to enhanced cell proliferation and neuronal differentiation compared to ATO grown in aqueous electrolyte, and ATO produced in both electrolytes performed better than plain Ti. The study results could be used to help reduce reactive gliosis (or glial encapsulation) for neural prosthetics where a patient’s immune response to the trauma of implantation can reduce the effectiveness of the device.